Music is a gift from God, and like all such gifts is designed to be used to bring Him glory. 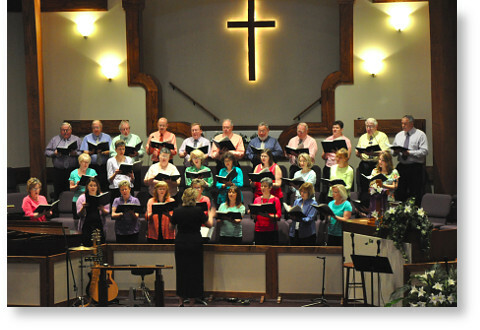 Providence Baptist Church desires to honor God with the appropriate use of music in our worship services. Our approach to music is a blended one, combining elements of both traditional worship services with those of more modern ones. Each week the musical aspect of our worship is supported by both an active choir and a worship team. We use both the traditional instrumentation (of piano and organ) and the modern (guitars, drums, etc.). We sing hymns, praise choruses, and modern worship songs. We've found that, generally speaking, the music of the older and younger generations are equally valid for the purposes of worshipping our amazing God. Understand the ministry and its expectations. We've gone through great efforts to document how our Worship Ministry functions on both philosophical and practical levels, so please take a few minutes to read our Worship Ministry Philosophy and Guidelines document. Pray. Seek God's will for yourself and your family on this matter. Other Instrumentalists. If you play an instrument not commonly employed in the worship services at Providence, you’re still encouraged to serve God with those talents, but yours will require a more individualized approach. If you think your instrument can “fit in” with the worship band, you will be asked to demonstrate this by making an audio recording of yourself playing your instrument along with the original recordings of some popular worship songs we use at Providence. If your instrument is simply a poor fit for the worship band, that’s okay – there are other musical moments throughout our services (the prelude, offertory, musical specials, etc.) which offer opportunities for service. Initiate a dialogue with the Worship Leader about your interests. Singers. All adults with singing talent are invited to participate in our adult choir. Practices are held Wednesdays at 7:30pm, immediately following the Mid-week Worship Service. No auditions are required – simply come out to a practice and the Choir Director will help you find your role. (NOTE: Our adult choir takes a break during the Summer, so no practices or participation in services occurs during those months.) In addition to the adult choir, we use a few vocalists during congregational music portions of our service guided by the Worship Leader and band. Because of the visibility of this position, these vocalists are selected only from the pool of volunteers who have already demonstrated commitment to – and aptitude in – other musical ministries of the church (such as the adult choir or youth worship team). If you wish to serve in this capacity, consider committing to one of these other ministry areas and serving faithfully there until you are asked about assuming a worship vocalist position. 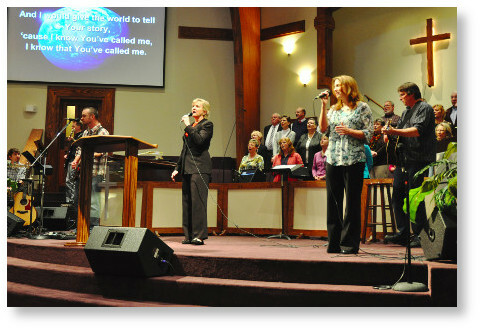 Below are examples of the music ministry at Providence Baptist Church. Samples presented here are not studio recordings, but rather simple audio console recordings trimmed from archived worship services and posted here solely for the purpose of providing folks a preview of our music ministry. Worship Set: "Here For You", "The Lord Our God", "Your Love Oh Lord"
Choir Anthem: "To God Alone"